This style is made from recycled cotton. 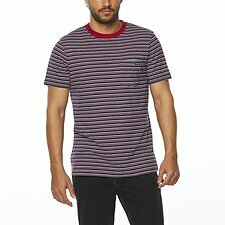 The Every Street tee is a regular fit tee block with single chest pocket featuring exclusive striped yardage. It's the tee for every street, whether it be driving on an open road on an epic road trip or skating down your street with a carton of beer on your shoulder. It's your casual everyday and anywhere tee.